The Thai ethnic minority group have a population of more than 1 million inhabitants living in the provinces of Lai Chau, Son La, Hoa Binh and Nghe An. The Thai have other names such as Tay, Tay Dam, Tay Khao, Tay Muoi, Tay Thanh, Hang Tong and Pu Thay. The Thai language belongs to the Tay-Thai Group. The Thai are experienced in consolidating edges, digging canals and building frames to convey water to the fields. Wet rice is their staple food, especially sticky rice. The Thai also cultivate rice, secondary crops and other trees on burnt-out land. Each family breeds cattle and poultry, makes wattle bamboo articles, weaves cloths and some families have developed ceramics. Thai brocade is very well-known for its unique, colourful and durable motifs. In recent decades, Thai men have adopted the Kinh's style of dress, while Thai women retain their traditional clothes including short vests, long black skirts, scarves and ornaments. The Thai live in houses on stilts. A Thai village, called a ban, comprises 40-50 houses on average built side by side. Among the Black Thai, the roof is shaped like a tortoise carapace with decorations called khau cut at each of the ridge. After a wedding, Thai men come to live with his wife’s family for several years. After a couple has a child, they move to live in the husband's house. The Thai believe they will continue life in another world after they die. Thus, they organise funerals like a farewell party to see off dead people to the next world. The Thai group comprises many family lineages and each lineage retains its own taboos. For example, the Lo never eat Tang Lo bird and the Quang abstains from killing tigers. The Thai people worship their ancestors, heaven, earth, ban and muong (hamlet and village). Every year they hold ceremonies to pray for good crops, which start by a ritual to greet the first thunder of the year. The Thai possess a valuable legacy of myths, legends, ancient tales and stories in verses and folksongs. The well-known epics include Xong chu xon xao (farewell to his lover), Khu Lu Nang Ua (Lu and Ua). The Thai knew how to write since time immemorial, and have kept recorded vestiges of ancient literature, customs and practices and folkloric genres on tissue paper and leaves. The Thai like to sing, in particular to recite khap, accompanied by string instruments and dance. 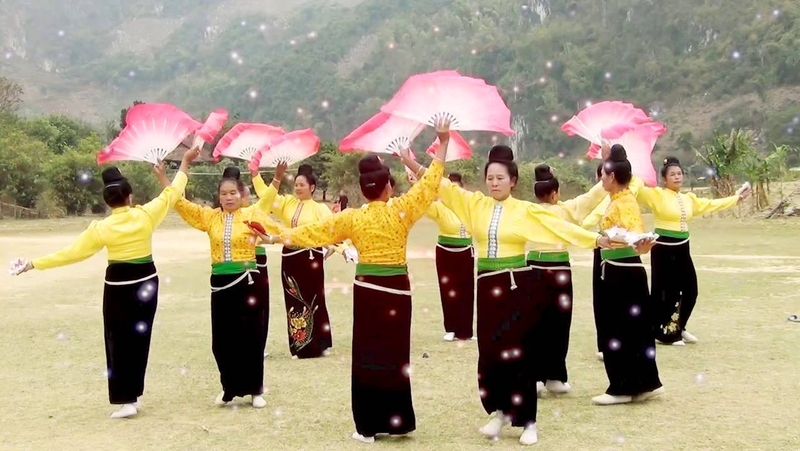 Their folk dances, such as Xoe and Sap (bamboo dance), are performed on stages. Han Khuong and Con throwing are also parts of the Thai's unique cultural character.